Using the potato masher (or other utensil that you may find easier) blend all ingredients well until the mixture is absolutely smooth. You may taste a little bit to check for lumps and to see that there is enough sugar and salt for your taste. 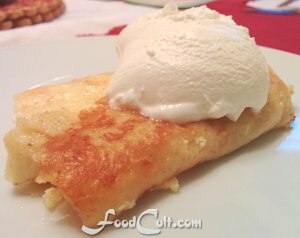 Put a dollop (a heaping spoonful) of the cheese mixture onto the side the crepe (about 1 1/2 inch [3 1/2 cm] from the edge). Fold the crepe over the top of the cheese. Fold the sides of the crepe over and then fold the crepe up so that it looks like a tiny pillow. Melt butter in the pan heated to medium-low. Place a folded blintzes seam-side down. Turn and fry the other side 'til done. ALWAYS fry your blintzes prior to eating as they contain raw egg. Start the filling process with the darker side of the crepe up. This way you will be frying the finished blintze on the light side of the crepe (they will be less prone to burning). Take care not to over-fry your crepes. They should be light golden on the inside and pale on the outside. Over-fried crepes will be more prone to breaking when rolling. Have too many? Freeze them for later use (put them, separate, on a cookie sheet. Freeze them - then bag them (so they don't stick together). Cheese blintzes (also known as: Blintze blintz, blin [plurals] blintzes, blini, blinchiki, blynai and others) were a family favourite. My grandmother would make them - stacks at a time and we would drive her crazy taking them from the fridge and eating them cold ... "Varm oop!" (Warm them up), she would yell at me ... but i couldn't help myself. She always had some pre-fried in the fridge. She knew we would grab them cold over her objections so there were always some pre-fried and refigerated. Remember: The cheese mix contains raw egg so, even if eating them cold, they must be fried! Mind you, I loved them - hot and sweet with a heap of cold sour cream. Many people would use a blueberry sauce (you can use our blueberry crepe filling - just cook it down a little bit more) on top but we always thought the filling sweet enough and the taste counter-point - cold sour cream - was the best choice. Bubbie's crepe recipe, the one we always use for blintzes, is a little bit milkier with a little bit more flour than the usual crepe (also known as "French Pancakes"). if you prefer an eggier, richer crepe, use this crepe recipe. You can always go get some Wallpaper Originals' Free Food Desktop Wallpapers for Mac & PC - now that you've found the web's best and easiest free cheese blintz Recipe.